Welcome back for the One Room Challenge's Week 2 (you can see Week 1 here)!!! I am re-desigining my daughter's play room/study room this time around. This area is also like a sitting room for my guests so it has to be fun and comfortable for my daughter but nice enough for our guests to hang out and watch morning news as well. Oh My Goodness!! in this challenge you get a real sense of how time flies and how much each day counts. 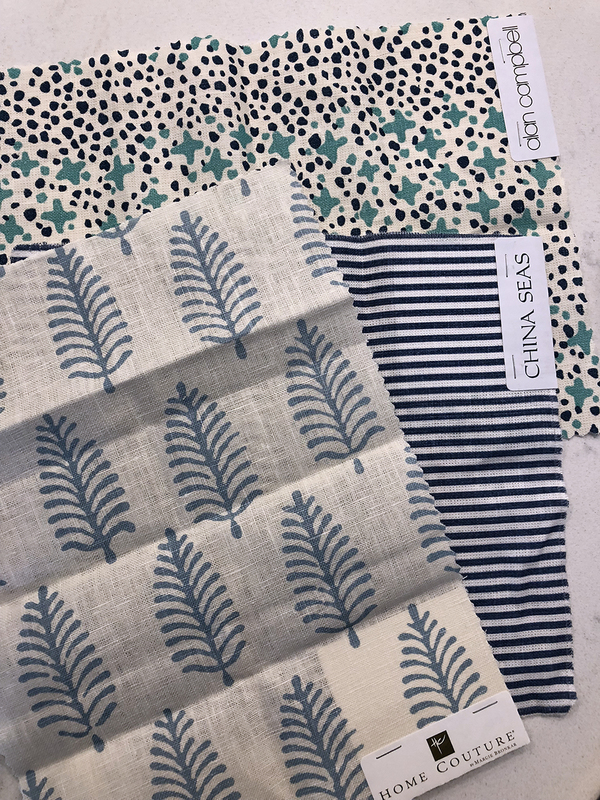 Ordering anything in interior design has long lead times...like fabrics and chairs...and they take time to make as well, like shades and pillows (I'm not your only client that needs this asap?!). We still have plenty of time. But anyway, I'm thrilled to be participating as a Guest Participant!! If you are not familiar with it The One Room Challenge was started by Linda from Calling it Home some years ago where she lines up twenty very talented featured designers to redo a room in just six weeks. They share their progress every Wednesday. And the Guest Participants (anyone can join!) report their progress on Thursdays. So, today is Week 2 of the spring One Room Challenge journey. This Azma Blue fabric is so pretty! It is a beautiful white linen with embroidered vines. And the secondary fabric called Baris Chambray has the perfect blues and pattern to coordinate exactly. Both fabrics are by John Robshaw textiles. But the ones below are so pretty.....It's so hard to let go of something so pretty for a more mature decision, right? But when I calculated my savings I was cured!! And once I recieved the fabrics I was so happy!! They are even more beautiful in person. Both fabrics are now at my seamstress to be turned into shades and pillows! On to making one of my life-long fantasies a reality. I have always wanted this chair. I tried it years ago at a friend's house and thought it was the most comfortable thing ever! No wonder they call it the womb chair. I wrote a post on it here. It has an interesting background story which I think you will enjoy. I also made a budgetary compromise on this one since the fabric I wanted was too expensive. So I chose this classic Knoll boucle in yellow to add some spice to the room. I know what you are thinking! Yellow?? or rather Chartreuse??!! But the room will be blue and white!! Yes, but the blue fabrics available were not quite right and so I opted for something fun and maybe a little wild. Chartreuse is a classic color in my world. I can almost envision my daughter moving into her first apartment and taking this gem of a chair wwith her. She loves it already! I love how excited my ten year old gets with these kind of things. She is my child after all! So you see....it will replace this Ikea chaise below. The rug will stay for now. I sent it out to the cleaners and it should come back this week. I did get a new rug pad which I will share more about when it arrives. It's great stuff when you can get excited about a rug pad! Now for the desk situation. My daughter, let's call her Miss A, loves to write and do crafts so I wanted to extend her desk area without spending a dime. So I just decided to move furniture around. I have another one of these same West Elm desks in our family room. See it here? Well I brought this white desk up to double her space. Easy, practical and free!! Thank you so much for stopping by. I will have another update for you next Thursday! And you also need to follow along the twenty featured designers (they post on Wednesdays! See them here for fabulous inspiration. I few of them are good friends and I can't wait to see what they do!